It’s a quite complex app, the kind I’ve not seen implemented in Flash. It must be pretty slick; it was named site of the day by Adobe earlier this year. Do be warned: you may need to read the help to use the site! Go to the website yourself and take a look. I don’t want to take away anything from the people who implemented it because it is very impressive, but is this the kind of GIS web map site that should be the public face of a county?? My current county has a horrible MapGuide mapping site (you know the classic ActiveX plugin MapGuide thing?) that is difficult for even me to use. Most county websites (no matter if they use ESRI, Autodesk, open source, other1) are very difficult to use, take forever to load, run very slow, require plugins, require reading a manual and frustrate the heck out of me. Shouldn’t a country web mapping site be simple and easy to use? I would assume the average user of a county website doesn’t have an engineering degree so why not aim these sites at the user level? And we need to be held acountable for accepting them (I’ve been using the Maricopa mapping site for as long as I can remember and I’m pretty sure I’ve never complained to the county, just on this blog). So right now I’m going to contact my county and let them know their website isn’t useful and you should do the same. 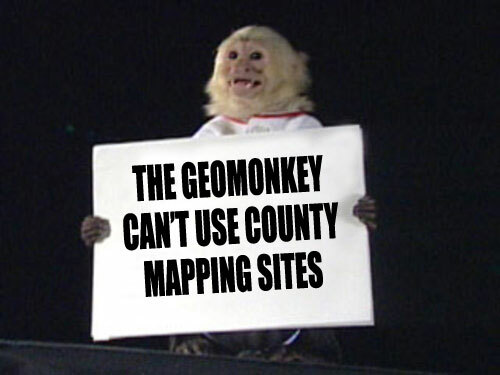 Won’t someone please think of the GeoMonkey?